This is a practice routine you can do on the putting green to increase your confidence on those tricky little short putts. Stick a tee lightly into the back of the hole (horizontally). Then practice hitting balls from about three feet firmly into the hole so that the tee gets hammered in. Then replace the tee and repeat the exercise. This will build up your confidence to firmly ram home the short putts on the course. This is another practice routine you can do with a tee. Stick a tee into the practice green and try and hit it with a putt from about three feet. Then gradually continue to move further away, still trying to hit the tee. As the tee is a lot smaller than the hole this will teach you to focus your aim,. Then when you are on the course the hole will seem a lot bigger and you will hit your putts with more confidence. Put a ball on the practice green a couple of feet from the hole and practice putting it using just your left hand (or just your right hand if you are left-handed). Once you hole three of these putts in a row, hold the club with both hands and putt another three balls with your normal putting swing. You will find it suddenly feels a lot more stable and you will putt with a lot more confidence. Repeat the exercise, gradually moving a couple of feet further away each time. This exercise is great for making your putting swing steadier and more consistent. Ground your putter and place a tee a couple of millimetres in front of the toe of the putter, and place another tee a couple of millimetres behind the heel. Then swing your putter with your normal putting stroke making sure you don’t hit either of the tees. Just continue to practice this swinging making sure you don’t hit the tees. This will make your putting stroke much more reliable on the course. A variation on the above steady swing practice is to place two tees spread just further apart than a ball’s width a couple of feet away from a ball and then practice putting the ball between the tees and into the hole. Improving your putting can make a huge difference to your results. 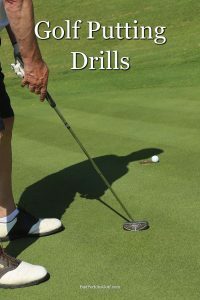 Try these golf putting drills to fine tune your skills and lower your scores.